It seems as if the summer season has begun--this week is fairly light on new art openings. So maybe this is the weekend to see some shows at the Menil again, or check out one of the many art exhibits that opened last weekend but that you haven't gotten around to yet. "Jsut That Way," curator's talk by Rachel Hooper about andy coolquitt: attainable excellence at the Blaffer Museum, 6:30 pm. Hooper tells you everything you want to know about Andy Coolquitt, Austin's master of crackhouse art and combining crap with crap. Introducing The Texas Punk Problem by Bill Daniel at Gallery Homeland, 7 pm. Friday and 7 pm. Saturday. 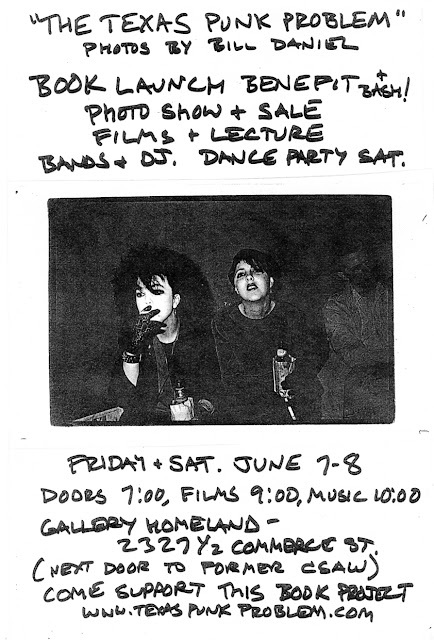 Photo exhibit, film screening, panel discussion, punk rock music and a fundraiser for a book project by Bill Daniel, the filmmaker who made Who Is Bozo Texino?. We've got nothing better to do than get nostalgic about old punk rock and have a couple of brews. James Turrell: The Light Inside from Museum of Fine Arts, Houston on Vimeo. James Turrell: The Light Inside at the MFAH, June 9 (through September 22). Hard to imagine a better way to spend a hot Sunday than taking a cool light bath in James Turrell's retrospective. However, the MFAH is severely rationing photons for this show and recommends that you make a reservation.